Matt Damon and Paul Greengrass finally reuniting – could the franchise be rebourne again? Walking speedily away from computers can only be mildly exciting. It’s no bourning love. Its few thrills and interesting developments won’t make this episode memorable. Boo-urnes. The real Jason Bourne is back, and so is the director most familiar with the muscular and amnesiac hero, Paul Greengrass. But what for? The last time we saw Matt Damon, in 2007’s The Bourne Ultimatum, the ex-special agent seemed to have finally discovered the truth about his involvement with the CIA’s infamous Treadstone programme: a true patriot with some past actions to make up for, he had deliberately volunteered to become a defender of his nation. It’s understandable that after the disappointing addendum feature, The Bourne Legacy, with Jeremy Renner ushered into the title role, the studio was keen to bring back the original hero to restore the glorious image of the original franchise. As such, the premise of Jason Bourne feels somewhat contrived. Despite knowing how he became Jason Bourne, David Webb suddenly starts experiencing brand new flashbacks revealing scenes of which he has no recollection: a discussion with his father, followed by the car bomb that killed him and the blurry crowd that gathered around the accident. Such a heavy-handed reviving of the story would be ludicrous were this new development not so genuinely affecting. By placing the death of Bourne’s father in the equation, Greengrass and screenwriter Christopher Rouse make Jason more human than he’s ever had the chance to be. Even though his girlfriend in Supremacy had brought out his sentimental side, her eventual assassination seemed to signal the ultimate impossibility for him to ever achieve any meaningful human attachment. His involvement in Treadstone suddenly appears as a more personal affair. Bourne’s sudden reappearance startles the CIA director Robert Dewey (Tommy Lee Jones) who, despite his semblance of poise, acts with uncalculated and shockingly unprofessional paranoia. Immediately supposing that Bourne is after the secret and dubiously legal new program he is about to launch, Dewey tries to eliminate him and thus ends up involving him in this scheme. The connection between these two stories, as tenuous as it is, still remains far more convincing than Dewey’s Internet surveillance program itself. In an understandable attempt to update the franchise for the digital age, the CIA are no longer relying solely on special agents to keep the world safe, but also on the services of Zuckerberg/Snowden-type hacker-hero, Aaron Kalloor (Riz Ahmed), who has constant access to the personal information of the world’s population. Unfortunately, Greengrass’ understanding of the computerised world reveals itself as in dire need of an update. Did you ever think, in 2016, that you would hear a cyber agent asking an assistant to “enhance” a CCTV image to magically get the suspect in focus? Beyond old fashioned, the debate over privacy is presented in a dumbed-down version, as though Greengrass didn’t trust his audience’s intelligence on such topical matters. At a media conference, Kalloor gets a standing ovation when he reassures a doubtful audience by simply stating, without any detail, that their privacy will never be threatened by his technology. Greengrass could justify his disinterest for ideologies and for today’s technologies if his approach to action were more considerate and gratifying. There is, unfortunately, no compensation for this apathy in either the physicality or the pyrotechnics of Jason Bourne. 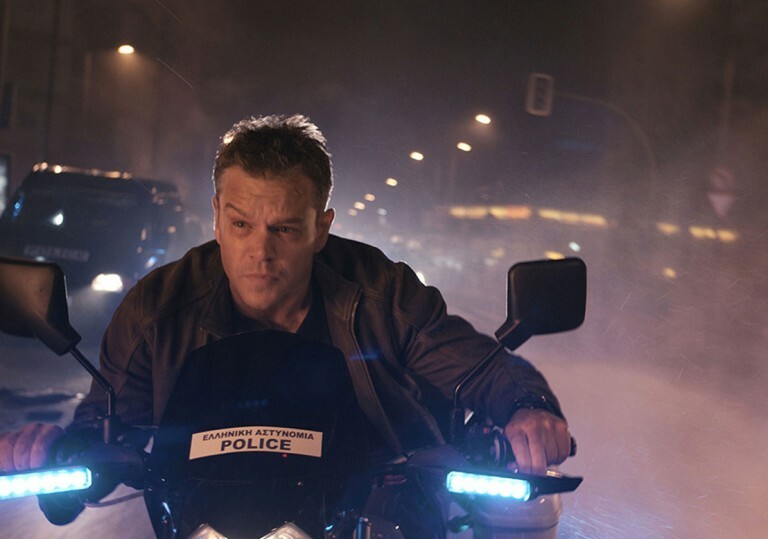 Apart from one gripping, extended pursuit between the hero and Vincent Cassel’s brutal lone murderer, most of the chase sequences see Bourne on site and observed by CIA agents via video surveillance. This arrangement explains why the rogue element must walk fast instead of run and blend into crowds rather than disturb them, but leaves little space for exhilarating action. 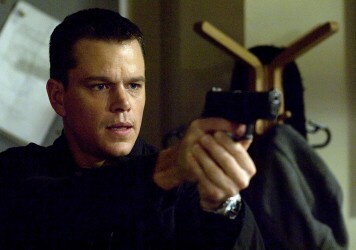 Nevertheless, the comedic device that makes for most of the franchise’s humour still appears in the few violent chases of the film: as Bourne makes an impressively bold move such as jumping off a bridge or changing lanes to drive against traffic, an agent watching the scene describes what just happened (“Sir, he jumped off the roof”) to his or her boss, who cannot help but express his disbelief, often with an explosive “he what? !” This absurd discrepancy between the immobility and incredulity of the CIA and Bourne’s immunity to the ills of gravity, has come to define the series and the spy genre at large. It also finds a new configuration here, as a woman comes to be the one observing his acrobatics. 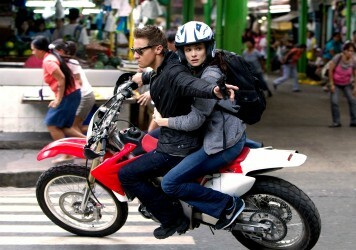 Once again, it is a female agent who seems to be the one who understands Bourne better. Alicia Vikander as Heather Lee is a newcomer, a cyber specialist who soon understands that Bourne only wants to know the truth about his enrolment in the project. She strongly echoes Pam Landy, the Joan Allen character from the previous films, yet only to the extent her intentions become progressively more ambiguous: in a spin on the CIA double agent motif, it seems that the woman rather than the man might this time be the most careerist and vengeful of them all. Vikander proves perfectly cast, as her severe, inscrutable face could be the mark of devotion and justice. Or it could reflect her ambition of revenge against Kalloor on obscure personal grounds. 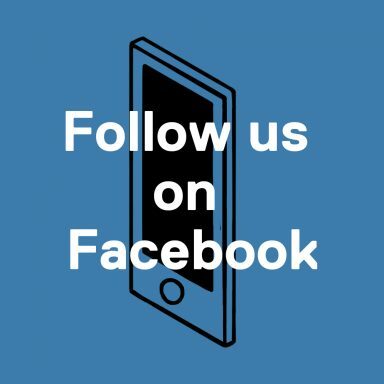 Most of the questions raised throughout the film remain unanswered. While such an obvious call for a sequel (the title itself refuses to use a conclusive word à la ‘Supremacy’ or ‘Ultimatum’) isn’t necessarily a nuisance, Greengrass asks for too much patience from his audience, and he gives them back little in the way of thrills. His already dated half-story will be back for another sequel, and hopefully it’ll be in better shape. Spy movie cliches are suppressed in favour of sensitivity and realism in the first three films of this unlikely mega franchise. Far from being a lean and exciting action caper, The Bourne Legacy wastes far too much time trying to justify its own existence. 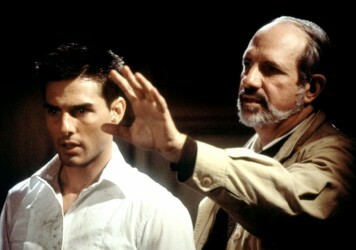 Twenty years ago Brian De Palma and Tom Cruise ushered in a new blockbuster era.